From My Hearth to Yours: A GIVEAWAY with Back to the Roots! Every now and then, I stumble upon a company that just has the right idea. Let me tell you, friends, with bonkers high standards and insistence on stellar customer service, I am no easy sell. 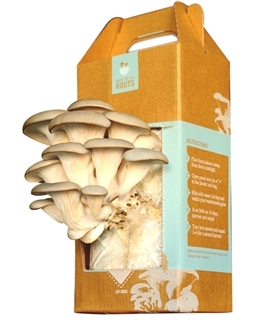 When my husband brought home our first Back to the Roots product, a kit for our family to grow our very own oyster mushrooms, I did my homework to learn more about this new company. Aaaaaand I'm sold! Finally, an approachable, environmentally conscious, noble company that I support 100%! I have had the privledge of communicating, firsthand, with several members of the Back to the Roots team, and I'd like to high-five every one of them. Good people, working for a good cause. Best of all, Back to the Roots promotes hands-on education and inspires both children and adults to learn more about the wonderful science that swirls around us every day. And because they're THAT awesome, Back to the Roots is offering one From My Hearth to Yours reader a free mushroom kit- to bring a little of the outdoors IN this winter. You'll marvel at the oyster mushrooms that will grow from your care...and then you can eat em' up in a savory new recipe that I hope you'll share when you're done! Extra cool? ALL From My Hearth to Yours readers get a 10% discount on any mushroom garden purchased from Back to the Roots' online store until February 28th! Simply enter the discount code 'FROMTHEHEARTH10' at checkout. P.S. How noble is it that Back to the Roots donates kits to classrooms when you help share your experience with their kits?!? Well all right! Wanna see how it's done? 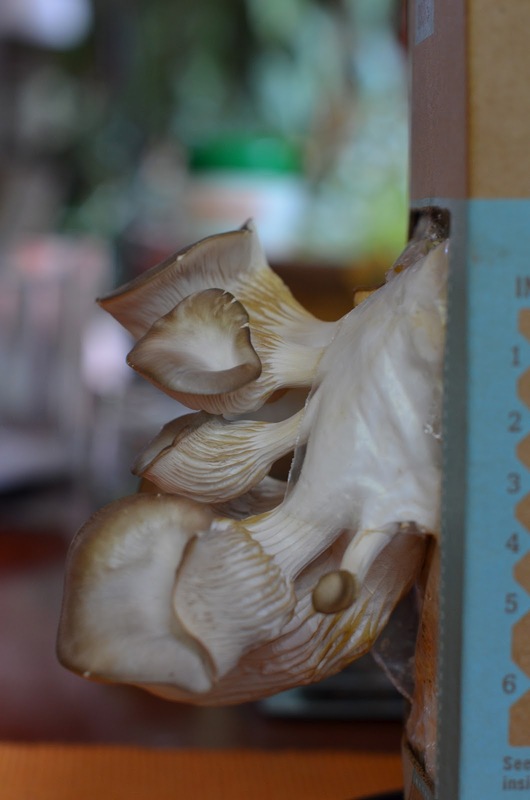 For details and photos of our personal experience with our Back to the Roots mushroom garden, catch up by reading my previous post, "Grow Your Own Mushroom Project." So "heads up" to my teacher friends, my mom and dad cohorts, my science nerd buddies and the culinary creators who are lookin' to jazz up their entrees. This is one giveaway that's sure to impress. So, how do you nab that prize? *Giveaway is open to ALL From My Hearth to Yours readers till Thursday, January 31st at 9p.m. EST. Winner will be announced on Friday, February 1st. Good luck, people! Three chances to win. Get it! BTW... I am in LOVE with your BLOG Cally!!! This is so exciting! The girls loved when you grew that kit and love hearing about your mushroom hunts! These two science nerds would go batty if they could grow this themselves! Cool giveaway! Well Willy might not be as good at taking care of the mushrooms as Kaira... but I'd sure like another to be donated to a (*ahem* Hamburg) school! Here's for facebook -- have any yummy recipes to add these mushrooms to? Do they have a particular taste that pairs with anything specific? Wow! This is awesome. I would love to have this! Of course I like you on facebook as well! My husband is Polish and mushrooms are a big part of their cooking. This would make him so happy. I google follow you too. I would love to win to share this educational project with my kids. I'd like to win so my nephew could watch mushrooms grow, He would enjoy growing and eating them. I would love to win this for my kids, they would be so curious about how this works! I would love to try this out. Sounds like an awesome company! Welcome to the Hearth! Here's to hoping that you and your nephew get a chance to try out this mushroom garden! I know you'd BOTH love it! Welcome Eileen! I'm so happy you stopped by and am sending you lots of luck to take home the big prize this week! Best wishes! I love growing my own food but have never tried mushrooms before. Thanks for the chance to win this kit! oh wow i love mushrooms, itd be so cool to grow my own! I'd love to win this so we can have fresh mushrooms on our salad! I love mushrooms and always wondered if these gardens actually work. Welcome aboard, new friend! These gardens TOTALLY work, and you'll just LOVE it! Best wishes to you and yours! My daughter volunteers in the garden all the time at school an adores mushrooms! I have a black thumb, so this would be a great way for her to grow at home! Living in a condo really limits the ability to grow plants and flowers.... I think this would be a really fun learning experience for my children and a great way to learn about growing food! This looks like it would be a lot of fun for Sylvia! Our family loves mushrooms and I think it would be interesting to see them grown in our house. My son is fascinated by things that grow! He would love to watch the mushroom grow! So happy to have ya! Good luck! You BOTH would love this experiment, Rachel. It's really just so much fun for everyone! Lots of smiles to you and yours! Thanks for swinging by, Joy! Sending you best wishes and lots of luck! How cool is it that you can EAT em' after you've grown them?!? AWESOME! Good luck! So happy to have you at the Hearth! Your daughter is the BEST! Tell her I think that is super cool!!! I'd love to hear how your family experience goes if/when you try one of these gardens. Report back if you win or get one of your own! Welcome welcome! Hope you visit the Hearth often!